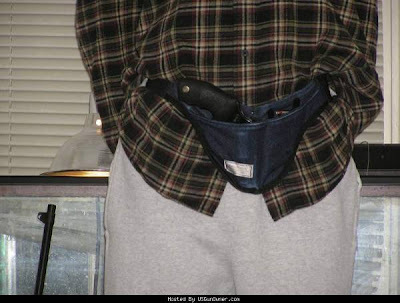 Jon Criss' Blog: SmartCarry - The "Invisible Holster"
Over the years I've used dozens of hostlers. Finally I'd decided that there was no one perfect holster for all situations. I always had to wear my shirt untucked or a coat to cover my gun. Besides keeping it concealed they were often uncomfortable to wear. They weighted down my clothes and if I needed to run they bounced around which gets annoying. 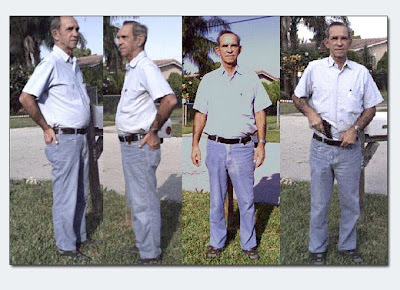 How would you like to be able to wear the clothing of your choice, with no restrictions, have complete freedom of your body movements, a real plus for active people, while carrying a concealed handgun in complete safety and comfort that no one can detect? Sound too good to be true? It's a fact that SmartCarry provides just that, for either male or female users (dresses and skirts)! A few years ago I saw The SmartCarry at a gun show. We all laughed as the guy drew his gun from inside the front of his pants but we didn't stay around long enough to hear anything about it. More recently I found two friends who had bought it and were quite happy with it. After hearing what they had to say I decided to get one. It did take a few days to get used to it but in a short while I hardly noticed I had it on. The SmartCarry holster makes a big claim: that their unique holster keeps a weapon concealed and undetectable by anyone. It really is The "Invisible Holster" (or at least it had better be!). I've baffled many as they tried to guess where my gun was hidden. Even in a standard pat-down it won't be detected. No need to keep a coat on or a shirt untucked. You could even go to the beach with just swim trunks and it would still be 100% concealed. Comfortable? I hardly notice I'm wearing it anymore! I have it on 16 hours a day and have done every activity without it hindering me. I've had it on while digging, biking, playing volley ball, and even jogging. One of the best benefits of the SmartCarry is it doesn't restrict what you can wear. I wear mine with my Wrangler jeans all week and to church or dressier occasions with my slacks. No coat to cover! What guns can you carry in it? The designer of the SmartCarry carries a full size 1911. I've carried a Glock 27 and now a Ruger SP101. Both of these work real well. If you're really active or wear tighter clothes the larger gun may be a problem. I'm now convinced this is the best concealed carry system. Best concealed. Most comfortable. Doesn't restrict the clothes you can where. Doesn't restrict the activities you're involved in. I've been wearing mine for a year now. Without this option it would be a hassle to carry in a lot of the places I go and with the active life I have. I haven't been disappointed in any way. To learn more see the SmartCarry website and their FAQ page.